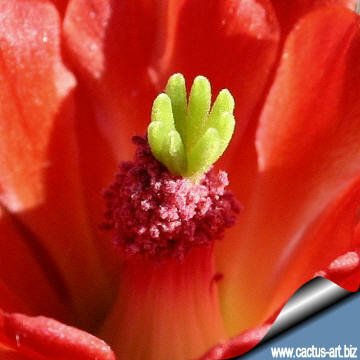 It is a beautiful plant with long-lasting, waxy, scarlet flowers, which make it a favorite among gardeners. 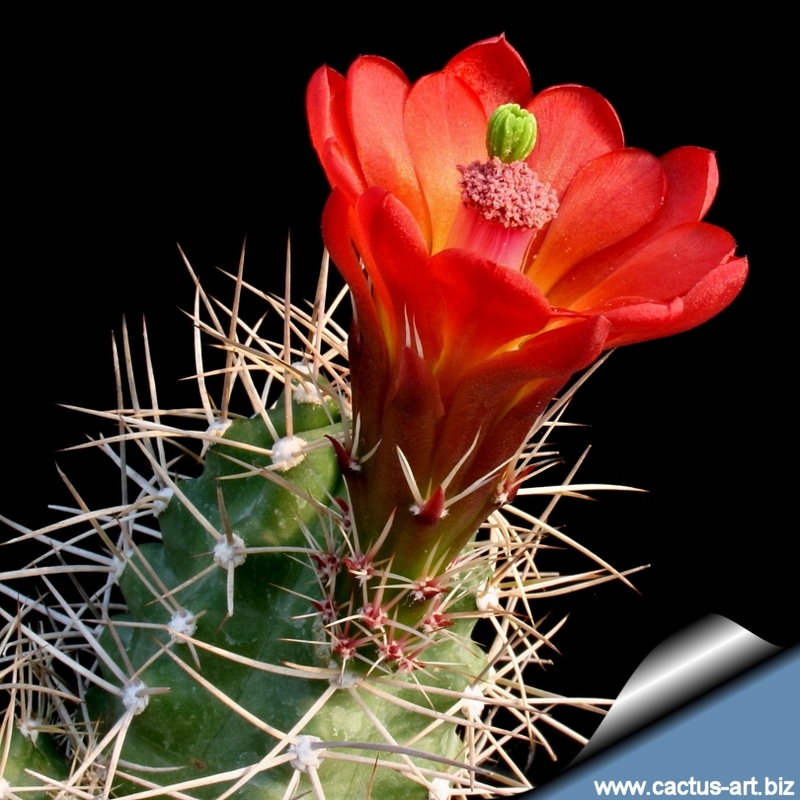 Description: In general it is a mounding cactus, forming bulbous piles of from a few to hundreds of spherical to cylindrical stems. 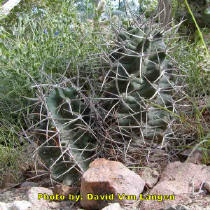 Plants may vary from densely spiny (usually) to no spines at all. 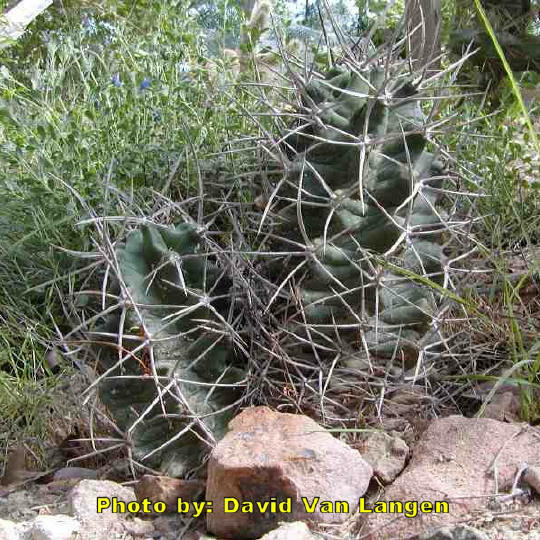 E. triglochidiatus is the most wide-spread of the Echiniocereus species and is also the most variable in appearance. I n fact, the several varieties are so different-looking that the only uniting factor is the bright red bloom and rounded petals. Areoles: 10-40 mm apart, and somewhat woolly. Spines (0-)3-11 per areole, with central spines being difficult to distinguish from the radial spines. Straight to curved or contorted, appressed (radial spines) or spreading to projecting outward (some radials, and central spines when present), white to yellow, gray, or sometimes nearly black, but those turn whitish-grey after their first season. Radial spines: (0-)1-10 per areole, (0-)15-90 mm long; Spines are at first yellow, pink or black. Central spines: 0-1(-4) per areole, angular, (0-)50-120 mm long. Flowers: Diurnal, funnel-shaped, 5-10 × 3-7 cm; flower tube 20-35 mm; flower tube hairs 1-2 mm; inner tepals bright orange-red to dark red, proximally paler (bases sometimes yellow or white), 25-40 × 10-15 mm, tips thick and rigid; anthers usually pink to purple. There is a thick nectar chamber and many thready pink stamens at the center of the corolla. The flowers are pollinated by hummingbirds. 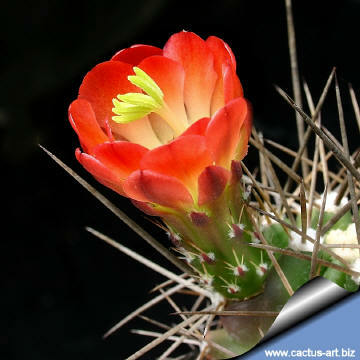 Blooming season: Apr-June, the flowers remain open for 2 or 3 days. 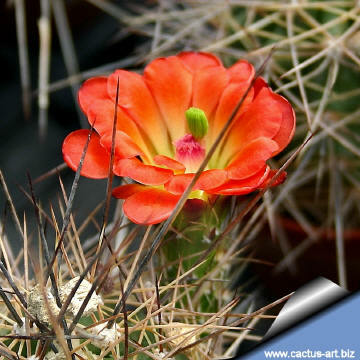 Blooming generally begins 5 to 10 years after sowing, as the plant matures. Stigma detail taken in my yard before sunset with a Canon mpe 65mm at f4.5 at about 3.25x - lifesize, multiple images composited with Helicon software. Artefacts, such as some minor fringing, were removed with Photoshop. The green stigma was about the size of a small grain of rice. 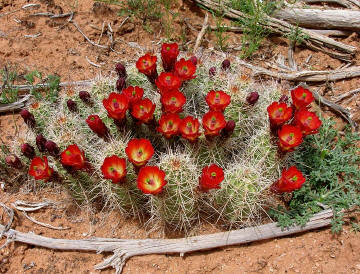 Photo of conspecific taxa, varieties, forms an cultivars of Echinocereus triglochidiatus. in F. A. Wislizenus, Mem. Tour N. Mexico. 93. 1848. Habitat: It is a resident of many varied habitats in the upper edge of the Mojave Desert, from low desert to rocky slopes, scrub, coniferous forests, igneous and calcareous rock outcrops and cliffs. It is most abundant in shady areas. These plants can grow in colder climates because the stems clump so closely together. This reduces surface area through which it can lose heat. 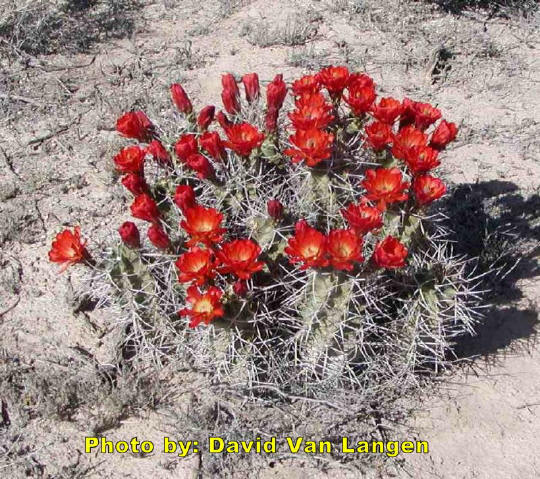 It can grow in elevations from 150 to 3500 m.
Common Name: Claret-Cup Hedgehog , Kingcup cactus, mound cactus, King's Crown Cactus, Spineless Hedgehog, Strawberry Cactus., Mound Cactus, Crimson Hedgehog, Claretcup Hedgehog, Curve-Spined Claret Cup,, Mojave Hedgehog, Mojave Kingcup Cactus, Mojave Mound Cactus, Mound Hedgehog-Cactus. Etymology: The genus name Echinocereus comes from the Greek word "εχινος (Echinos)" meaning" Sea-urchin or Hedgehog"
The species name "triglochidiatus" is formed by the prefix “tri” meanening “three (3)” plus the Latin word “glochidium” a “barbed hair of a plant or a spine” referring to the spines found on areoles along the ribs, but not all the plants bear clusters of three spines, and usually more than three spines are found in each cluster. The glorious flower colour of the hedgehog cactus rivals that of the desert sunset. The flowers are a beautiful deep red, with many petals that form the shape of a cup. 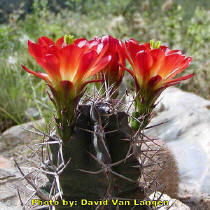 They bloom from April through June, and are the first to bloom in the desert. E. triglochidiatus var. triglochidiatus Plants with the fewest and largest spines, that occupy the eastern portion of the species’ distribution. The central or radial spines are sharply angular in cross section, and 1-2 mm thick. E. triglochidiatus var. gonacanthus a name carelessly applied to miscellaneous plants throughout the range of var. triglochidiatus. E. triglochidiatus var. mojavensis (Engelm. & Bigel.) 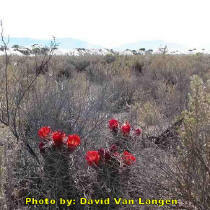 L. Benson : Mojave desert, chaparral. This taxon includes curly-spined plants (mainly in California) and straight-spined plants (including most populations in Arizona, Utah, and western Colorado). The variety E. triglochidiatus var. toroweapensis Fischer has been proposed. A spineless form (var. inermis) has been applied at various taxonomic ranks to individual plants with spines absent or nearly so in the eastern portion of var. mojavensis, mainly found in the mountains and mesas of western Colorado and eastern Utah. 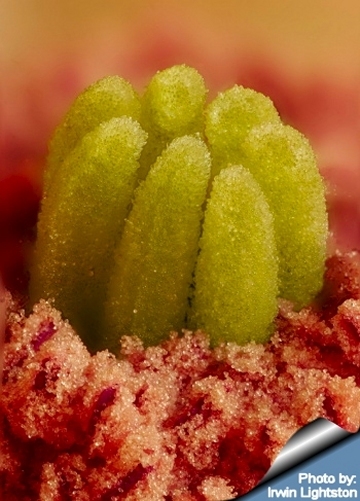 On these plants, areoles may have very few spines and some stems can be almost completely spineless, but the same plant will have spined stems and many spines per areole in another area. Echinocereus triglochidiatus is the earliest name for a large group of diploid and polyploid taxa treated as conspecific by L. D. Benson (1969, 1982). The tetraploids are now recognized as a distinct species: E. coccineus, including E. polyacanthus Engelmann of Mexico. 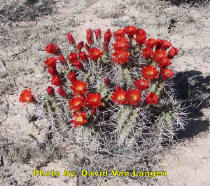 A geographically distant tetraploid, Echinocereus coccineus var. paucispinus, superficially resembles some eastern E. triglochidiatus but may be distinguished by its relatively terete and more consistently straight spines. USE: Some Native Americans collect the stems, burn off the spines and mash them. Sugar is added and then it is baked to make sweet cakes. White Sands National Monument May2002. 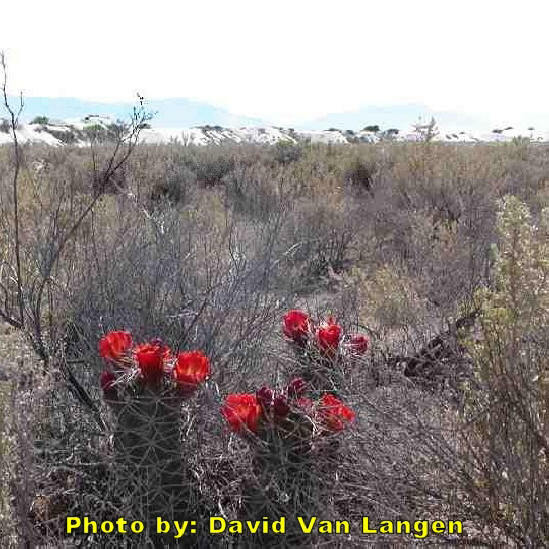 White Sands Claret Cup just beyond the dunes. 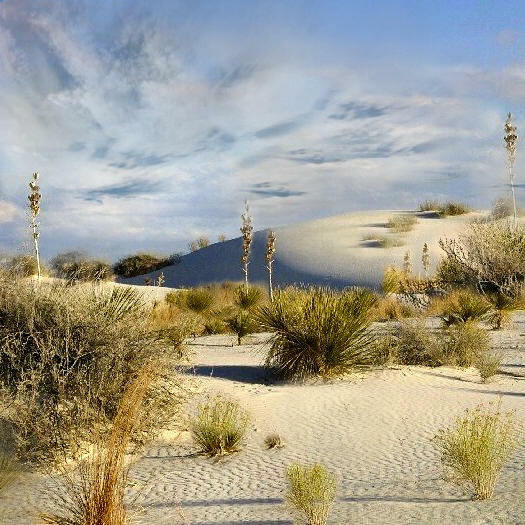 White Sands National Monument (S. central New Mexico, in Tularosa Basin): "the soil there is terrible!! Even the mesquite trees only get 4 ft tall and look dead most of the time. It also gets close to 10 F° (-12° C) on cold winter days but warms up within a few days"